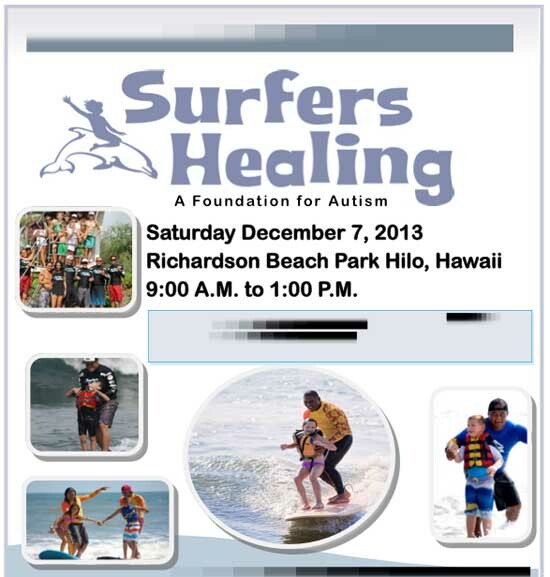 A free Surfers Healing Camp for children with autism and other disabilities is 9 a.m.-1 p.m. Saturday, Dec. 7 at Richardson Ocean Park in Hilo. Now in its fourth year, the Surfers Healing Camp provides disabled children and their families with the unique experience of surfing with professionals under supervised conditions. Knowledgeable surfing instructors, surfboards and U.S. Coast Guard-approved life vests will be provided at no charge. Complementary drinks, snacks and lunches will be offered to participating children, their families and event volunteers. Surfers Healing is a national organization started 15 years ago in California to share the joy of surfing with the less fortunate. Its Hawaii Island chapter is sponsoring the December 7 drug-, alcohol-, and tobacco-free event. Additional support provided through a partnership with the county Department of Parks and Recreation, HMSA, Hawaii Behavioral Health and Hulakai Surfboards. An estimated 200 people, including approximately 50 keiki, are expected to participate in the Hilo camp. Surfers Healing Camps are held throughout the world, providing more than 3,000 children annually with the opportunity to try surfing. Space is limited, and spots fill up fast.